Brian Holden is a Thunder Bay based artist and arts educator. His work is highly influenced by his surroundings and this is reflected in studies of the landscape and flora/fauna of this region. He was born in Northwestern Ontario and during his youth had the opportunity to live around the province in a variety of small communities that bordered on wilderness (boreal forests of Northern Ontario) and less populated rural regions of southern Ontario. In his childhood and teen years he spent time exploring the woods and fields which forged a deep respect for and love of nature. This has continued to be the source of inspiration for the imagery he creates. Brian studied the basics of visual art for a one year period at Sheridan College in Brampton Ontario. After this he made the decision to undertake an independent direction with his creativity. He took the basics of visual arts fundamentals he learned and through selfteaching has expanded his skill and understanding of a range of various mediums. He has called Thunder Bay his residence since 1980 and this is where his artistic explorations began with detailed graphite drawings on paper followed later with landscape and still life studies in watercolour and acrylic. In 1983 he rediscovered printmaking and began producing small silkscreen studies. These works made their way into different venues around the city of Thunder Bay and introduced him to the public as an emerging local artist. The first recognition came in 1981 when he won the coveted first place award in drawing at the Canadian Lakehead Exhibition. This was followed in 1984 when he received an honourable mention for a small detailed graphite drawing titled Boreal Road. His study was chosen by a jury of 3 noted Canadian artists as one of thirty works representative of visual art being produced in this region. A tour titled Art Affairs North followed and exhibition in public galleries across Canada ensued. Since that time Brian went on to display artworks in many collective artist shows in Northwestern Ontario. In 2010 he was invited to be part of a trio show at Gallery Stratford in an exhibition of print based studies that examined the role of water in the environment titled Watermark. 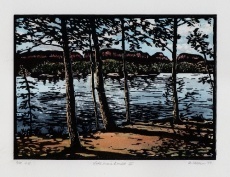 This was followed later that same year with his first solo exhibition in series of multidisciplinary prints titled Wilderness at the Pictograph Gallery in Atikokan ON. From Jan - April 2012 this same solo exhibition made its debut at the noted Thunder Bay Art Gallery. This was accompanied by an artist talk and two printmaking workshops. Brian presented a series of miniature size prints Sept 2012 in an exhibition titled Look Closer at the Baggage Building Art Centre Gallery in Thunder Bay. Brian also displays his work online in a website and has a blog dedicated to his artistic pursuits. 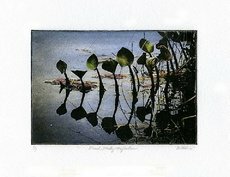 Printmaking has been his focus for the past two decades and various methods used to make a print have provided the stimuli and challenges to keep his attention focused towards this art form. He has employed a variety of printmaking disciplines in his studio practices that include relief block printing, serigraphy (silkscreen), intaglio processes (etching) plus collagraph and monoprint. Recently he has been exploring the application of relief engraving. His painting skills also are applied into some of the print imagery through hand colouring. Brian has a firm belief that printmaking can retain its traditionalism but can also welcome and incorporate new technologies. 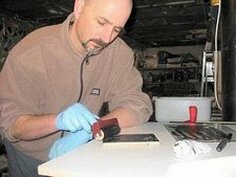 He is active in the local arts community and was a long-time member of a local art collective. He is also a strong supporter of non-toxic printmaking practices. Not only is Brian a studio based artist but he has been active sharing his knowledge and expertise as an arts educator in the educational system through provincial and regional funded Community Arts and Heritage programming and also through the Ontario Arts Council Artist in Education program. To read or download a detailed curriculum vitae, please click here.